Observer’s in the UK and Western Europe need to direct their gaze low to the southwest an hour after sunset to glimpse the 7-day-old Moon (first quarter occurs in the small hours of Saturday, 1 July) a low-power binocular field of view to the right of Jupiter in the bright twilight of Friday, 30 June. The following night finds the waxing gibbous Moon a similar distance to the largest planet’s upper left, forming a near isosceles triangle with first-magnitude star Spica in Virgo. For scale, Jupiter and Spica are currently separated by about the span of a fist at arm’s length. AN animation by Ade Ashford. 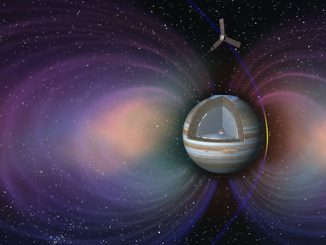 It’s hard believe that 12 weeks have elapsed since Jupiter was at opposition. But now that we are into summer, the Solar System’s largest known planet is already sinking in the southwest when it can be first seen with the naked eye in bright twilight around 10:30pm BST from the UK. If you find it hard to locate Jupiter in the bright sky around civil dusk, a convenient celestial marker in the form of the almost first quarter Moon sits just 6½ degrees to the right on the planet on the evening of Friday 30 June. The pair can fit in the same field of view of wide-angle 7× binoculars. One night later, the 8-day-old Moon lies 6.4 degrees to the upper left of Jupiter, forming an almost isosceles triangle with first-magnitude Spica, the brightest star in the constellation of Virgo. Jupiter and Spica are 10&frac23; degrees apart at this time, roughly the span of a fist at arm’s length. If you are successful in catching a glimpse of the changing configuration of this celestial trio on the nights of 30 June and 1 July, reflect on the knowledge that Jupiter (distance 491 million miles, or 790 million kilometres) lies about 2,000 times farther away than the Moon. And at a distance of about 250 light-years, Spica is a staggering 3 million times more distant than Jupiter! 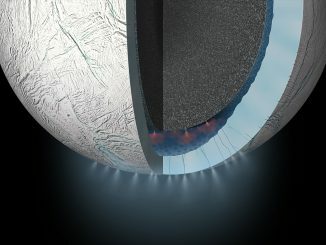 Scientists announced Thursday that measurements from NASA’s Cassini spacecraft detected hydrogen gas, a key energy source for microbial life, in a plume gushing from a vast liquid water ocean buried beneath the icy shell of Saturn’s moon Enceladus. On 5 March 1979, Voyager 1 made its closest approach to Jupiter, passing at a distance of about 349,000 kilometres (217,000 miles) from the planet’s centre. 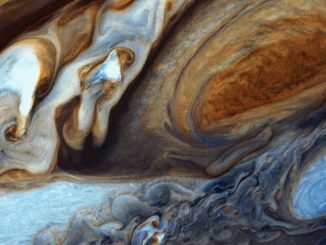 It captured this close-up view of the swirling clouds around Jupiter’s Great Red Spot in February as it approached the gas giant.